Everyone wants their kids to be comfortable, and some studies suggest that long-term back health and good posture may hinge on what someone sleeps on even early in life. Sealy has a great name in “big people” mattresses, so I had every reason to believe they make great crib mattresses too. I live in a small town, so the options are pretty much limited to what Wal-Mart carries unless you’re willing to go to a very expensive furniture store. I think Wal-Mart has this one, but I actually bought it secondhand off of a local Upcycle page. Chances are, more than one person cringes at the thought of secondhand mattresses. It’s given me pause in the past. I decided that, for the price, it was worth it. 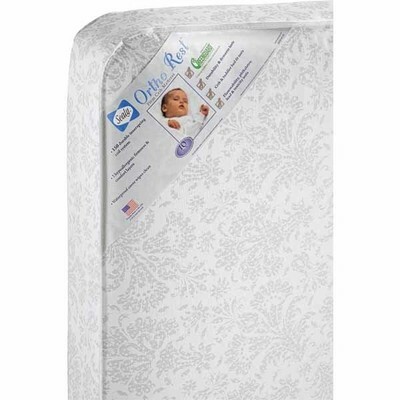 Money happened to be extremely tight at the time and a lady offered me this Sealy Ortho Rest baby mattress along with a 3-in-1 crib for $50. I couldn’t say no. Thankfully, baby mattresses are made to be easy to clean, not let anything soak into them and resist germs of all types. I went for it. I honestly don’t recall what full retail is locally for just the mattress new, but you can buy them online for under $100. As with most baby mattresses, the Sealy Ortho Rest is a little firmer to the touch than you’d expect from an adult mattress. It’s covered in vinyl instead of fabric. My pediatrician confirmed that, especially for babies, firm is a good thing – it helps keep her comfortable before she’s old enough to roll, and it significantly reduces the risk of suffocation by keeping squishy things out of the crib. Statistics show that a good mattress could also reduce the risk of SIDS, which is a huge selling point in our family since my husband’s older brother died from that mysterious affliction. Overall, the mattress seemed comfortable to the touch with just enough give to cradle a baby’s tiny bodily contours. My daughter started sleeping on this mattress in her crib when she was five months old. From the outset, she seemed to sleep much better on this mattress than on the thin sleeping pad that came with her bassinet. She started sleeping through the night within about two weeks of moving to the Sealy Ortho Rest. It’s anyone’s guess if it was just time for her to start sleeping through or whether we can give the mattress credit. The edges of this mattress have enough form that fitted sheets stay firmly in place, even with a baby tossing and turning throughout the night. She’s never been able to pull a sheet loose no matter how she moves, even as she’s gotten older. We no longer have to worry about her suffocating in loose sheets, but it’s a huge plus knowing that she’s not sleeping on bare vinyl, especially on warm nights when large areas of her skin come in direct contact with the sheets. My daughter moved up to a twin-sized bed when she was 4 years old – two years in the crib and two in the toddler bed, all four on the Ortho Rest. Thanks to the vinyl, there are no odors on the mattress despite surviving potty training and a little brother that likes to dump juice on her bed. The vinyl cover is torn in several places, though I attribute that to having rowdy kids who jump on the bed every time they think they can get a bounce or two in before I stop them. It hasn’t gotten brittle or discolored in the slightest, so I’m certain that the tears are not a quality issue with the mattress. At the time my daughter stopped using this mattress, she was about 35 pounds and just over three feet tall, so she could technically stay in her toddler bed for a while. We moved her to a “big girl bed” when she started complaining about the mattress being too hard. She didn’t like staying in bed at night anymore, and we’d find her curled up on the couch with the dog almost every morning. I honestly have no idea if the mattress is too hard because it’s made to baby firmness, or if it’s starting to break down with age. Since we don’t know how old the mattress actually is, or the kind of treatment it received before we bought it, we won’t hold that against it. It might be something to keep in mind for your kids that are on the older end of toddler bed occupancy. Overall, this mattress seems like a great quality for its middle-of-the-road price. When bought new, the manufacturer does offer a guarantee against any quality defects. We didn’t have that guarantee, but don’t seem to be any worse off for it. It looks like the four years with this mattress, through one kid, is all we’re going to get out of it. We do have one younger kid, but we’re now in a much better financial position to just buy him a new crib mattress if we need to. We definitely got enough value out of it to be worth buying new, and will definitely consider buying the same type of mattress again.